Learn what guests have said about our beautiful waterfront space. 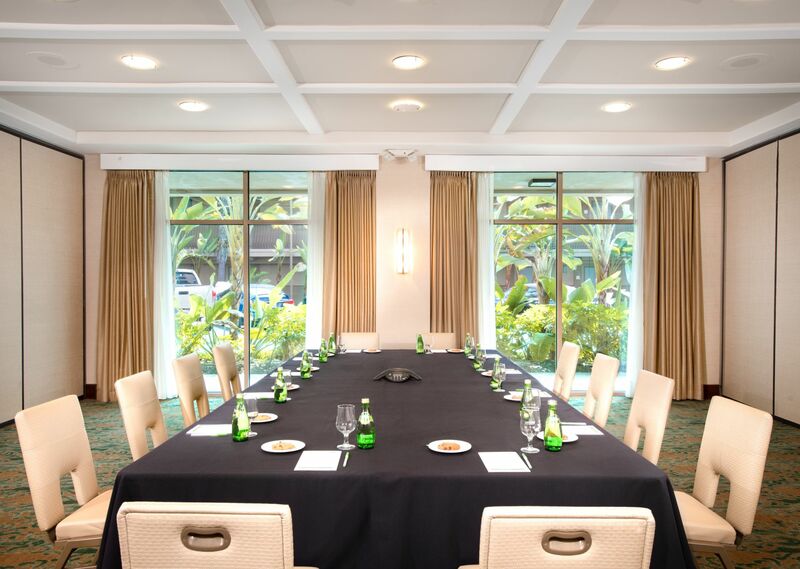 Read guest testimonials, reviews, and experiences with our expert event staff and San Diego meeting space facilities, and see how your next gathering can be elevated. This past weekend we held a convention at this hotel for over 80 people. We had 5 outstanding catered meals. Despite the fact the hotel had at least 2 other groups our service and quality of food was outstanding. Everything we needed or asked for was done quickly and efficiently. The rooms were great and it was the first hotel where no one complained of either freezing to death or being too hot. We had such a great time we plan to return next year! Thanks to the ENTIRE staff from registration, room staff and catering and events. I was there last weekend and I just wanted to say thank-you for the service to our group it was the VA-56 Reunion. The wait staff in the cafe were great the way they took care of our every wants. The bar staff the way they put up with us. I can't say enough about the bus drivers the way they took care of us getting us where we wanted to go, and then picking us up. Again thank everyone of your staff. We recently had a US Navy Squadron reunion in San Diego at the Holiday inn Bayfront and we were very satisfied . The property allowed us easy access to where we needed to go . Starting with breakfast ,we Had over 26 people hitting breakfast at the same time and they just took it in stride .Great service and great food.Very reasonable .Rod was our server and he handled most of our people with ease. I would like to mention the Shuttle service as they really made our group Moves around the city pretty seamless . Thanks Andre and Rob for getting us around on such short notice. Thanks also go to the Pool Bar for supporting us after making it back to the hotel. The pool deck was Very nice and provided a place for us to gather as a group. Last but not least ,Thanks to Jodie Langhammer for her help in making our little Reunion a Success.Holiday Inn Bayside Did a great job for us and again we say Thanks. The Holiday Inn Bayside contributed significantly to making our Officer Candidate School W7101 Class Reunion a grand success. I worked with Jodie Langhammer, National Sales Manager, for over a year and found her very amiable, professional, and thoroughly supportive of our event. She went out of her way to help me through all negotiations and planning which I truly appreciate. Due to the professionalism of Jodie, Patrick, Director of Catering, the wait staff, front desk staff and the housekeepers, all our reunion events went off without a hitch. Attendees commented about the helpfulness of the front desk personnel and I experienced excellent care from housekeeping. There were absolutely no negative comments about the hotel or reunion which was marvelous considering that some of the participants worked in the area of event planning while on active duty . All staff and employees were proficient and very friendly, always greeting us with a smile. The banquet food was delicious, the room was set up elegantly and the dinner was very nicely served. Our group really enjoyed the Hospitality Suite which Patrick set up very nicely. All our needs being met by this wonderful hotel, we were free to enjoy fellowship and events. Thank you for all your help and support. I will recommend your hotel for reunions at every opportunity. We held a series of courses at this hotel in October and it was a fantastic experience. The property is lovely: the décor is very fresh and modern and maintained beautifully. And the staff…I don't know if I have adequate superlatives! Pat, in A/V and the banquet team that assisted us were attentive, friendly and worked their backsides off. And two front desk representatives were remarkable: Katia and Emily. When one of our speakers became quite ill, these two young women went above and beyond the call of duty to work with me in extending his room reservation, securing his belongings and providing information about nearby health centers. In an age where customer service is often lacking, these two women are a breath of fresh air. Holiday Inn Bayside provided exceptional service for our group. Charleene was thorough, thoughtful, kind and such a delight to work with. We will definitely be back for all of our business experiences for our team. Thanks for providing excellent service. My service was great and Carrissa. Was very accommodating to what I was asking. Great service. Had a great experience working with the Holiday Inn for our project in San Diego. The staff was flexible, positive, and always eager to help us get where we needed to be. Absolutely recommend using them in the future for business travel. The entire staff are wonderful and Jodie Lanhammer was fantastic! Our 2017 Reunion was absolutely great because of the facility and the staff. The meals in the hotel were exceptional for a hotel. They were very attentive and reasonable prices. The Holiday Inn Bayside San Diego was a wonderful place for our family reunion. Right from the pre-planning stages all the way to the event, the staff was accommodating, quick to respond, informative and genuinely helpful and friendly. The venue, itself, met our needs and more, there were amenities for varied ages. All the hotel staff, from housekeeping to catering greeted us each day and made sure that we knew they were ready to assist. Hats off to all of the staff. You make this hotel a desirable location for return business. We had a memorial service reception for my dad, in the Harborview Room located on the fifth (5th) floor of the Holiday Inn Bayside. The view was spectacular, the service, and food amazing!! Everything was ready to go ahead of our arrival. The room looked absolutely beautiful. I have nothing but gratitude for the service provided to my family. Charleene Pissot, and her staff, assisted us with the menu choices, decor, A/V options and numerous other details. (and they were so flexible!) They made our day with family and friends, a memorable one! IThank you, Thank you, Thank you! Staying at the Holiday Inn Bayside was an absolute amazing adventure for our out of town guest. There was so much to do during our stay, it was filled with so much love and joy! Thank you Holiday Inn Bayside for your wonderful services and hospitality. From the Johnson / Vance Family! My 1977 Class of the Cavite National High School held our 40th Class Reunion at the Bayside Room at the Holiday Inn Bayside San Diego. My principal points of contact were Lindsey Wong and Samantha Siedenburg. In a nutshell, I could not have asked for better party planners! These two ladies were tireless and patient with all our queries, requirements, and the changes we made, some at the last minute! The upgrades and discounts they gave us (some we were unaware to even ask for!) were invaluable as, I'm sure one is well aware, events like these are often on a tight budget. Discounts on dance floors and AV equipment to upgrades on room size were very much appreciated! When it came to the event itself, everything, and I mean everything!, worked flawlessly. The dinner was delicious and accounted for correctly, the AV equipment worked without fail (thanks Alex! ), early access to the room for setup was unhindered, bar was setup on-time, thanks very much to Pat, our on-site, event point of contact. Everybody in my class had a wonderful time and not one mentioned any hiccups (as is often the case) with the event site. Thanks again to Lindsey, Sam, and Pat and the rest of the Holiday Inn event team for an angst-free event! Praise from us (and others as well) is well-deserved! Our organization held a training session for one and a half days ay HI Bayside. The sales department led by Charleene Poissot was somattentive since the first daynIninquired about the property. Charleene and Samantha were so communicative about our needs during the planning phase. The property was lovely, my room was so comfortable with a beautiful view, and the meeting space was perfect. It was spacious and the food was terrific. The staff who helped with the food and AV was extremely attentive. You cannot beat this property for a wonderful place to meet in San Diego. You can also take advantage of the free shuttle. Location and property and staff are top notch. Charleene and team at this Holiday Inn are phenomenal! Yet another year of a flawless meeting. Albeit a 1-day meeting, the attention to detail is superb. Thank you for an amazing team! The Holiday Inn-Bayside has been hosting the POW's annual holiday party for many, many years now. They always provide a wonderful experience for this group of great American heroes, their spouses, widows, families, and friends. Many thanks to Charlene, Pat, and all the staff for making the 2017 party a huge success! Already looking forward to next year! I couldn't be more pleased with the choice of properties for our company meeting. We brought in a small group from across the US, so being close to the airport was important. Lindsey did an awesome job planning everything for me and made great recommendations so I could concentrate on the meeting. The on-site staff was very professional and attentive and the food was outstanding. Great comments from my team. Thanks Lindsey!